If your hearing aid is malfunctioning, it might be time to have it services. To retain optimum hearing conditions, it’s important to get in the habit of daily cleaning and regularly servicing your hearing aid. 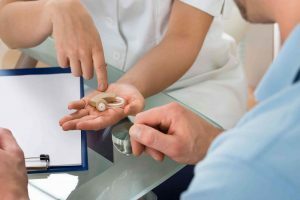 If your hearing aid is malfunctioning, there are a number of things you can check as possible solutions before you take it in for servicing. Here’s what you can do. If your hearing aid instrument is dead or performing inconsistently, check to see if the battery needs replacing. If your hearing aid isn’t loud enough, it could be that your receiver tube is blocked and needs cleaning. For more comprehensive damage or defects, you’ll need to see a hearing aid professional. Earwax and debris that accumulates in the ears and on hearing aids is one of the most common causes of device malfunctions. Properly cleaning your hearing aid will help extend the life of your device and ensure optimum hearing conditions. Remove earwax. Whenever you purchase hearing aids, you should receiving cleaning tools including a soft brush and a small pick or loop. Always follow the manufacturer’s instructions on how to clean your hearing aids. If you have trouble, your hearing specialist can help. Wipe hearing aids dry at night. Use a dry soft cloth to clean hearing aids at night. Do not use water, alcohol swabs or cleaning solvents. These things can break down or damage your hearing aids. When you’re not using your hearing aids, make sure that they kept somewhere dry and away from heat and moisture. It may also be worth asking your hearing specialist about dehumidifying boxes for storage. These boxes help keep your hearing aid safe by removing moisture that can corrode sensitive circuitry. While most hearing aids today are designed with water resistance, you should still avoid using your hearing aid in the shower, while swimming, or when using a hair dryer. When applying hair sprays, insert your hearing aid first and then applying the product. This entry was posted on Tuesday, December 27th, 2016 at 11:46 am. Both comments and pings are currently closed.